Q: What are some notable characteristics of the Umpqua National Forest? Phillip Elden: The Umpqua forest is known for its beautiful rivers and streams. Many of Oregon’s native salmon and trout spawn in these waters. Plus, there are several different types of trees in the area, some that are almost 400 years old. It feels a little bit like traveling back in time. Examples include western hemlocks, true fir, Douglas fir, cedar, oak and ponderosa pine trees. Q: Is wildlife a prominent part of the forest? Phillip Elden: This forest provides a habitat for everything from elk, deer, black bears and cougars to foxes, raccoons and bats. If you’re lucky, you can sometimes see an eagle or peregrine falcon while hiking. Q: What does the word “Umpqua” mean? Phillip Elden: There are two meanings: “thundering waters” and “across the waters.” Umpqua is also a name that refers to numerous groups of Native Americans that reside in south central Oregon. 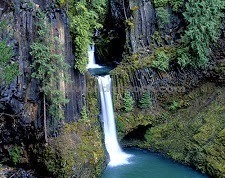 Q: Why is the Umpqua National Forest such a beloved tourist spot? Phillip Elden: It’s recommended as a place to visit, hike, camp and mountain bike. When I’m training for a large-scale climb, I often come here even to do a day’s hike. The trails range in difficulty, so I can push myself as much or as little as I want. Q: What recreational activities are popular at Umpqua National Forest? Phillip Elden: Recreational activities enjoyed by visitors include hiking, fishing, horseback riding, boating, rock climbing, mountain biking and camping. Winter sports include both downhill and Nordic skiing, along with snowmobiling and snowshoeing. Also of note—the Oregon Omnibus Wild and Scenic Rivers Act of 1988 identified a part of the North Umpqua River as “wild and scenic.” Approximately 26 miles of the North Umpqua River run through this forest.